WatermIll to restore - why not the next Grand DesIgn project!! Stone 16th century mill house with annexes on 3000 m² with private access to the river. Le Moulin. The French word for a mill is an evocative one, and for many, conjures up that most romantic of dreams of a life under the French sun (Life in France), a dream of living in a windmill or watermill that has been converted into a stunning home. "Would be expatriates" avidly read books written by those who have bought and converted their mills, and for some, on discovering an unloved wind or watermill in the right location, ripe for renovation and at the right price, that dream can become a reality. A little patience is required when you first set out to find the moulin of your dreams, as unsurprisingly, they are not the most common type of property listed in an estate agents window (French estate agents). Local knowledge can come into play, so it can pay to get to know your chosen area and the people who live in it, as quite often these types of unusual properties never actually come onto the open market but are sold privately, with only a handful of people being aware that they are for sale at all. However, France is, especially in certain areas, a land rich in mills of both types, and patent, diligent searching can result in a successful purchase. The type of housing offered by the two different types of mill differs greatly, and it is really a matter of personal choice. Often, the grander and more spacious accommodation is afforded by an old watermill, but even these can vary greatly from tiny, unassuming buildings to huge properties of which the watermill is just a part. Many are extremely picturesque, but others are more industrial in nature, needing greater vision to transform into desirable homes. Watermills are impossibly romantic places, and if the property includes a real mill race still rushing through, the sound of the water becomes an evocative accompaniment to everyday life. Some mills though, no longer have the water at all, the source having dried up or been diverted over time. Windmills too have certain characteristics, and are defined by their shape which begins with a roundish, wide base narrowing to a small space at the top. Planning the living space in a windmill is therefore important, and you must be prepared to work within the constraints and to climb lots of stairs! However, the views from the top are often spectacular, and offer perfect compensation for the climb and cramped conditions in the uppermost rooms. You also need to accept, as with most things in France, that there will be a vast amount of paperwork to complete and almost certainly, a long period of waiting before you are able to go ahead. And although mills (both types) can generate useful amounts of energy for domestic use, there is also the likelihood that you will need a top up source of power, so consider the possibility of also installing solar panels to boost the output. A working mill requires maintenance, of course, and if you want to live with the ecologically sound power produced by your own mill, you have to be prepared to take this on the chin. Watermills will need careful attention to the turbines, and it is often necessary to remove algae and weeds as often as every day to keep things in smooth running order. Windmills too need care and attention to keep the sails moving freely, and repairs need to be made swiftly if damage occurs. Replacement sails are expensive, and there can be difficult to access cleaning work required to the higher level exterior of a windmill thanks to the mess left behind by birds who also find mills attractive homes. While some dream of converting a moulin themselves, others do not relish the hard work of the conversion nor the uncertainty of obtaining planning permission, and may prefer to consider purchasing a mill that has already been converted. Depending on the size of the property, there are various options available here. Large watermill properties can come offered as several apartments, which could be ideal for those seeking holiday homes rather than a full-time living option. In these cases, before buying your apartment, check out any hidden costs such as maintenance charges and any conditions which may affect the quality of life, such as restrictions on noise, pets ands similar. The advantage, apart from having no work to do on this type of property, is that you can simply lock up and leave when your holiday is over, in the knowledge that the property will be cared for in your absence. There are few regions of France which do not have at least a few of these ancient properties, but some areas are a more likely hunting ground than others. Mills, by their very nature, are found in agricultural areas, so consider regions such as the Limousin (Limousin Property Guide) or the Lot (Lot Property Guide) where farming has always been the mainstay of the economy. 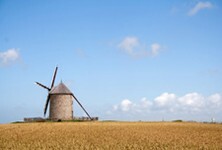 The Vendée (Vendée Property Guide) is another department where mills are found in numbers. It goes, I am sure, without saying, but windy areas like the Aude (Aude Property Guide) are also an obvious setting for windmills! It is possible, if you are lucky, to find an unconverted mill requiring considerable work for not much money. There are small windmills which have been sold recently in our area (Aude, Languedoc) for as little as 50,000 Euros. However, these are few and far between, with prices for unconverted mills even in disrepair often being nearer to 250,000 Euros. If you are considering the purchase of a substantial, converted and ready to live in wind or watermill you are probably looking at somewhere upwards of 300,000 or 400,000 Euros, depending on the size and location of the property and the quality of the conversion. 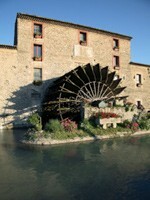 Just in the process of purchasing an old water mill in the Baronnies near to Capvern. Intention is to use the water power to generate our own power. We would be very interested in sharing ideas with any other like minded individuals. We are looking at low head systems, we have a large volume of water but quite low head.